Hillside AM Challenge will be arranged on Saturday 22 August 2015. The entry opens on Monday 20th April, 8.00 pm. "Just want to say thanks for a fantastic event! The food made it magical, not to mention the ride! I'm sitting in the car with a smile on my face in spite of my broken rear brake and derailleur; munching on a cookie makes it easy to forget. I'll have to try to lure that recipe out of you. First of all I'd like to express a big thanks to you for arranging this event. It was huge fun even if I thought I was going to die of exhaustion a couple of times during the race. Going to definitely do it again next year if you arrange it again. Thanks for putting together a fantastic event. Everything went great, from the logistics of giving out the race bibs to the food to the race itself. Let the marshals know that they did a great job cheering us on. The lemonade and energy bars were heavenly...is the recipe a secret? Prepare for Launch: The years toughest MTB race is Saturday, August 23rd at 11:00. You can now dowload the PM for the race(Swedish only). Attachments to the PM: Map access roads and map start- & finish area. You now approach one of the highlights: Getryggen. After descending, turn right toward Svarttjärn and continue to Soldatängen. A long technical climb is waiting for you there on Leopold’s Secret Trail. After passing Blacktjärn it’s time for the next challenge: climb Blueberry Trail. Elevation profile, click to enlarge. Race bibs (number plates) along with snack coupons can be picked up at the mtbstore the week before the race. The Cookie Monster has promised to leave some chocolate chip cookies for you. Timing starts at 11:00. If you’re shooting for one of the top places, you must use Strava. This also applies to the downhill prize where the fastest (not the first) down Getryggen wins. The Climb prize, however, goes to the first man and woman up Getryggen, as recorded by a marshal. Maximum 100 participants. Registration fee is 250 SEK which includes the massive homemade energy bar. Homemade raspberry lemonade, sandwiches and of course homemade cookies after the race. Here's a video from the course. It shows many parts of the course and its characteristics. Maxim Sweden contributes with four energy kits for the SWAG giveaway. Duells contributes with a luxurious Lezyne Port-A-Shop tool kit. The winner of the downhill segment can pick up a brand new helmet from Sweet, POC or Troy Lee Designs. If you’re lucky at cards you could win a gift card worth 2000 SEK, which you can use to buy any product from Norröna. See the link to the product range. Here you also pick up your bib and snack coupon for the race. Skeppshult contributes with four pairs of Schwalbe mountainbike tires. 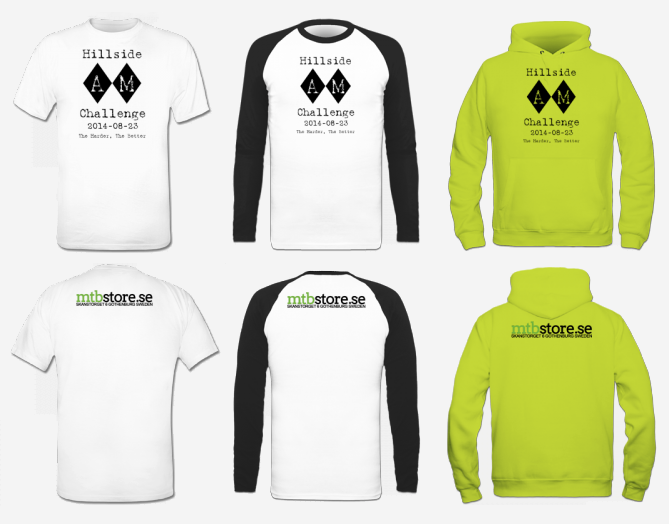 Hillside Cycling and mtbstore.se will be presenting all marshals with a 250 SEK gift certificate to... you guessed it, the mtbstore.se! The winners of the Climb prizes will each receive a 160 SEK gift certificate for gourmet goat ice cream from Gettergod Gelato. The Women's winner will also be awarded a lamb and the Men's winner a goat. We'll also be contributing with the luxurious Lezyne Port-A-Shop tool kit.